DOCTOR WHO grabbed hold of me when I was 8 years old. I was watching TV at 6 pm and changing channels until I came across THE ARK IN SPACE Part 1 on KSPS, a PBS station. Soon I was hooked and I watched the good Doctor for the next few years. After the show was cancelled and I started buying Doctor Who Magazine, I didn't watch the show as much for the next few years after that. During the mid-1990s, I did start watching like a diehard fan again and even watched the 1996 TV movie. I hoped for a long time that the good Doctor would be back with new episodes and the BBC would make a new series. Now after 16 years of no new show (except for the co-production of a TV movie with Universal in the USA), DOCTOR WHO is back. The new series does have great writing and excellent wit, but the first six episodes under head writer Russell T. Davies don't quite snap and pop like the best of the old series. It's not until Simon Pegg (of SHAUN OFD THE DEAD) who plays an old time Doctor Who baddie that the series begins to pick up steam. It has another bump when Captain Jack is introduced in EMPTY CHILD and the two part season finale is some of the best Doctor Who ever done despite the final scene being too melodramatic. Despite the show's music being a little iffy at times, the signature theme tune rocks. 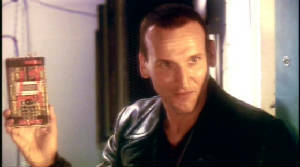 Christopher Eccleston is excellent as the Ninth Doctor and wait until you see what happens at the end of the season and continues over into THE CHRISTMAS INVASION. The Doctor is a Time Lord with two hearts and he can change his appearance 12 times by regeneration. He travels time and space in the TRADIS which is bigger on the inside than outside while being stuck in the shape of a blue British police box on the outside. He usually travels with one or more companions. The latest is Rose (British pop star Billie Piper) and she isn't weak. She doesn't scream and tries to get into the action to help the Doctor. Just wait until you see The Christmas Invasion as Rose deals with the thing that many before her had to deal with when it comes to the Doctor. It is 15 minutes longer than the usual episode (I wonder if Sci-Fi will air it long or edit 15 minutes out), but you do see hints of UNIT and mention of Torchwood (which happens to be the name of the spinoff series). One of the best parts is the preview for season 2 at the end of The Christmas Invasion. It will look like season 2 will be better than season 1. I do think the 45 episode format is OK for the new series (the old series was divided into 25 minute episodes), but the show is at it's strongest with the two parters (as the old series had many excellent 4 parters and 6 parters (and even 7)). The series does have the advantage of not padding the storyline like some of the longer classic Who stories did. I am happy to hear some old faces are returning for season 2 (like a certain enemy that came before Star Trek's The Borg and a couple of old friends from the classic series plus one face that Buffy the Vampire Slayer fans will recognize). I'm happy to see the show is back and as great as ever. I hope Davies doesn't stay too long and hands the reins to someone who can take the show to different strengths (like Classic Who with the change of producers over 26 years). I think the classic series may have died due to John Nathan Turner's 10 year stint as the head producer of the show. However, the good Doctor may have just needed a rest to come back as a popular series again (since ratings declined as the 1980s went on). This time he is back with a bigger production budget and a budget to do special effects (where the classic series had to make do with small production budgets). DOCTOR WHO lasted so long and came back so strong due to the appeal to people of all ages. The classic series rested on the shoulders of great stories and actors. The new series does the same despite episode budgets on par with those of shows like THE X-FILES or any of the START TREK shows over the last 20 years. If you haven't checked out DOCTOR WHO, check out to see what you have been missing because this British sci-fi show wasn't popular on a fluke. It is damn good drama. BEST EPISODES: most of the second half of the first season of this new show. if you can, watch the Doctor Who Confidential episodes that take a look at the new and old series of Doctor Who when the first season is release in Canada this month and in the USA in July.